1966: Robert Motherwell executes large mural for the John F. Kennedy Federal Building, Boston, MA. The abstract mural in Boston's new John F. Kennedy Federal Building is a full 180 sq. ft., cost $25,000, and was simply titled by its painter, Robert Motherwell, New England Elegy. But it did not remain that for long. Up on the wall last week it became everyone's Rorschach. Office workers began to see in the top black band the outlines of a gun stock. Then reports got around that the title was actually The Tragedy of President Kennedy's Death. Where did it all lead? To the experts, of course. Shown a photograph of the painting, Boston Museum of Fine Arts Assistant Curator Thomas N. Maytham noting the massive angular shapes, suggested that "one black blotch may represent the profile of the President's head, a very direct and specific depiction of the most brutal moment of the tragedy, when Kennedy was struck by the bullet. The lines near the 'profile,' " he said, "represent either the trajectory of the bullets or spatters of blood. It is hideous in one sense," he concluded, "because it doesn't try to walk around the issues." Which was more than Maytham could claim when he later recanted, pleading ignorance of the actual title. By that time, though, the only one who couldn't see something in the painting was the artist himself. Fumed Motherwell: "The painting is totally abstract. It is not a picture of Kennedy's death, but an elegy, which is an expression of grief for someone dead, like a requiem mass." Motherwell should know. It is the 104th elegy that he has painted in the past 18 years, and nobody has ever admitted seeing anything in one before. 1966: Adolph Gottlieb's studio and its contents are destroyed by a fire. 1966: Barnett Newman completes Here III. Barnett Newman's sculpture Here III (1965 - 1966) was cast in steel, as was Here II (1965). Here I (1962) was in bronze. Here I and Here II were cast in an addition of two whereas Here III was cast in an edition of three. The steel used for Here III was stainless steel and Cor-Ten steel. 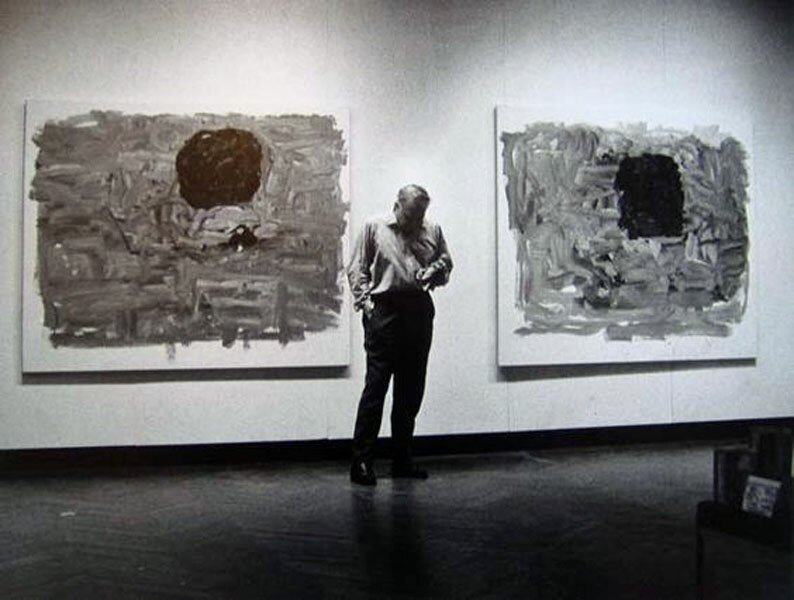 January 12 - February 13, 1966: "Philip Guston: recent paintings and drawings" at the Jewish Museum. Harold Rosenberg wrote text for the catalogue. After the Jewish Museum show, Guston turned to everyday objects for his inspiration - possibly reflecting the influence of Pop. January 1966: Willem de Kooning is admitted to Southampton Hospital after a binge. February 18, 1966: André Breton dies in Paris, France. When Mr. Breton returned to France in 1946, the world had changed. If such painters as Matta or Wilfredo Lam had given surrealist art a new lease on life, existentialism was dominating the literary scene... Nevertheless he continued to write, publishing two magazines, a work on Rimbaud, poems and essays... The last years of his life were spent in a country house in southwestern France and in an apartment at the bottom of Montmartre littered with manuscripts, books and African art. He was suffering from Marcel Proust's disease, asthma, and recently told a friend that the one writer he envied was Victor Hugo "because at his funeral were all the people of Paris." April 1966: Barnett Newman has his first solo exhibition in a museum. May 1, 1966: Barnett Newman defends the Stations of the Cross in a public discussion with Thomas Hess. "Hess and Newman: A Conversation" took place at the Guggenheim Museum during the Stations of the Cross exhibition. Just as the Pop artists seemed to be re-discovering the primary colours, Newman also began "confronting them" for his series "Who's Afraid of Red Yellow and Blue." "I began this, my first painting in the series 'Who's Afraid of Red, Yellow and Blue,' as a 'first' paintings, unpremeditated. I did have the desire that the painting be asymmetrical and that it create a space different from any I had ever done, sort of - off balance. It was only after I had built up the main body of red that the problem of color became crucial, when the only colors that would work were yellow and blue. It was at this moment that I realized that I was now confronting the dogma that color must be reduced to the primaries, red, yellow and blue. Just as I had confronted other dogmatic positions of the purists, neo-plasticists and other formalists, I was now in confrontation with their dogma, which had reduced red, yellow and blue into an idea-didact, or a best had made them picturesque. Why give in to these purists and formalists who have put a mortgage on red, yellow and blue, transforming these colors into an idea that destroys them as colors? I had, therefore, the double incentive of using these colors to express what I wanted to do - of making these colors expressive rather than didactic and of freeing them from the mortgage. July 1966: Frank O'Hara is hit by a car on Fire Island. O'Hara was riding in a beach taxi on Fire Island at 2:00 a.m. and one of the tires came off the vehicle. He got out of the taxi and was standing apart from it when he was hit by an oncoming jeep. Elaine de Kooning heard about the news at a party in East Hampton and rushed to tell Bill. They drove together to visit O'Hara in the Bayview General Hospital in Mastic Beach. According to O'Hara's friend, Joe LeSueur, de Kooning presented the hospital with a blank cheque saying "I vant the best for our friend." (DK483) De Kooning, who was one of the few people who were allowed to see O'Hara in his bed, later recalled "He [O'Hara] had so much grace, that man, even through all the delirium and agony." (DK484) O'Hara died two days after the accident. 1966: Willem de Kooning paints new women. c. Summer 1966: Mark Rothko visits the Tate Gallery in London. Winter 1966: Philip Guston ends his affair and returns to Woodstock.